General Thomas J. Jackson is one of the most revered as one of the greatest military leaders of all times. He earned his nickname,"Stonewall J. Jackson", at the battle of Bull Run, where his brigade stood firmly against advancing Northern troops. This replica Saber mirrors the one General Jackson carried when he first began his tour in the Army. Featuring a 28" stainless steel blade with intricate etchings. 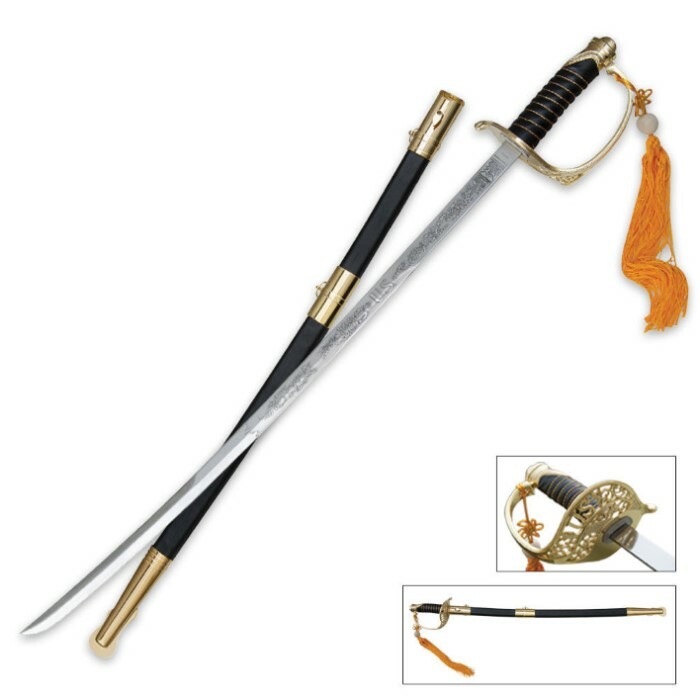 The leather wrapped handle is accented with brass plated guard and pommel. The sheath is leather wrapped with brass plated accents. Includes custom gift box. I just got this saber after waiting just 3 days! It is both impressive in design and not expensive! I am quite satisfied with my purchase and will order more from budk! I am considering to get my JROTC honor guard a full saber renewal and since these are way cheap but high quality sabers, I see them as a better option than the $150+ sabers that are less impressive. Worth it!